I’ve long since gotten tired of American news, in all media: print, evening news, 24-hr talking heads, etc. Everything is so sensationalized and marketed to capture the interest of your average disinterested, entertainment-hungry American. But this is trite; I’m saying nothing new. I just wanted to preface the following example, which pissed me off this morning because it’s blatantly sensationalized, and utterly unnecessarily. It’s a story about two “proximity events” near JFK airport, in which two planes came close to their safety margins in terms of distance in air. 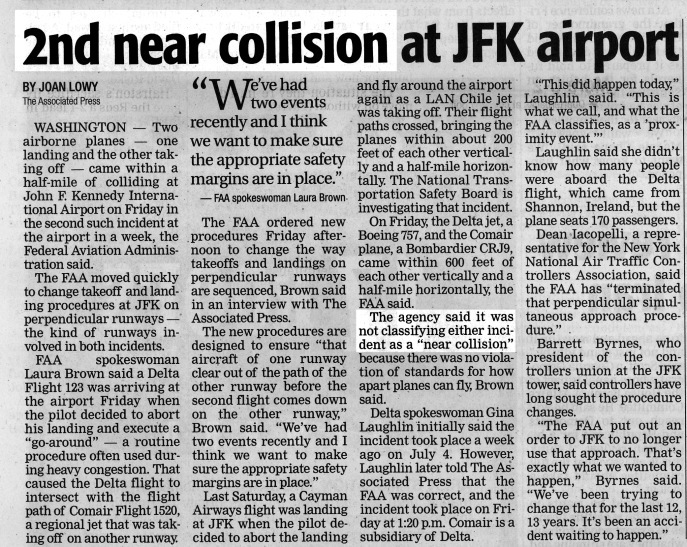 Notice that the headline is “2nd near collision,” and yet in the article itself very specifically says: “The [FAA] said it was not classifying either incident as a ‘near collision'” (emphasis added). This entry was posted in World and tagged rant on July 12, 2008 by ColinM.